In this innovative volume, Laurie Choate, an EdD associate professor and counseling educator at Louisiana State University at Baton Rouge, has edited a significant work specifically addressed to the field of counseling. Counseling – something of a generic term – usually encompasses clinicians who have PhDs or EdDs in Counseling or Educational Psychology, and includes many diverse types of masters’ levels counselors, psychiatric social workers, and other practitioners who offer counseling services. As Dr. Choate notes in the Foreword, although counselors often receive little training in the assessment and treatment of eating disorders, they are likely to encounter large numbers of patients suffering from eating disorders in the course of their routine professional activities in schools and in practice settings. 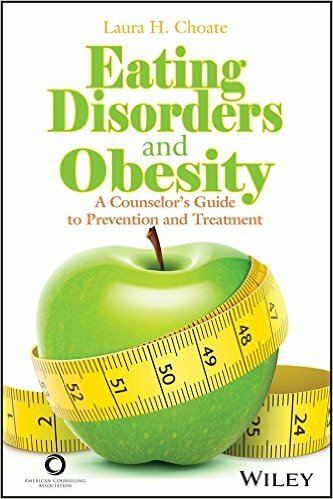 Accordingly, the book aims to provide counselors with the background information, education, and preparation they require to recognize, assess, help and triage patients with eating disorders and obesity across the continuum of severity from pre-clinical (prevention) to severe illness, and across diverse cultural backgrounds. To accomplish this goal Dr. Choate recruited over 40 collaborating authors, including many counseling and clinical psychologists and other professionals who are well recognized for their contributions to the field of eating disorders, to provide 18 well-constructed chapters that substantially meet the goals set out for this project. and legal issues that counselors need to consider and address in practice. A section on assessment describes diagnostic issues around specific eating disorders and eating disorders not otherwise specified (EDNOS) and situations likely to be encountered by school counselors. However, given the book’s title and aim, I was surprised that it lacks a chapter that specifically overviews and provides assessment information on obesity per se. As befits a counseling-oriented book, the section on prevention seems the most robust, covering childhood obesity, and eating disorders in children, adolescents, young adults, and prevention activities in college and university settings, including the description of a cognitive behavioral therapy (CBT)-oriented guided self-help program for binge eating. The substantial section on treatment can, of course, provide only an introduction to what’s available. The focus is largely on evidence-based treatments, including CBT, interpersonal therapy, family-based treatments, dialectical behavior therapy (DBT) for complex eating disorders clients, a relational-cultural approach for dealing with eating disorders clients, and psychosocial approaches to obesity and aberrant eating in youths. Wisely, these chapters offer rationales, overviews, and recommended resources for interested readers who wish to go further. However, given the important role that counselors play in triage and referral, in my view this section would have benefited from additional material concerning indications for various levels of care, including medical evaluation and treatment. This volume is published by the American Counseling Association, so the book is primarily aimed at individuals who self-identify as counselors and who qualify for membership in the association. Since counseling can also describe the types of interventions offered by many clinical psychologists, psychiatrists, primary care physicians and nurse practitioners, the potential audience for this book is quite large.